When I was searching Google for cheap American Girl doll accessories, the first three search results were to American Girl’s website. I’m not going to lie. When the American Girl catalog arrives in my mailbox, my 36 year old self gets super giddy and I revert to my 8 year old self. I pour over (drool over?) that catalog even more than my kids do. BUT… I find it really, REALLY hard to pay American Girl prices. I want my kids to be able to PLAY with their dolls and lose pieces and potentially destroy things without it making me losing my mind. My kid’s 18 inch dolls (American Girl and Our Generation dolls) are a MESS. The hair? Oh, I can’t even. Whenever they play with their dolls, I have to hold myself back from rushing in there, grabbing the dolls from their little hands and brushing that hair for what likely would be a couple hours. Only to have them take the dolls back and destroy their hair again in seconds. My 3 year old? She makes her doll walk by holding onto her hair. *Cringe. * My 6 year old truthfully doesn’t treat her doll much better. 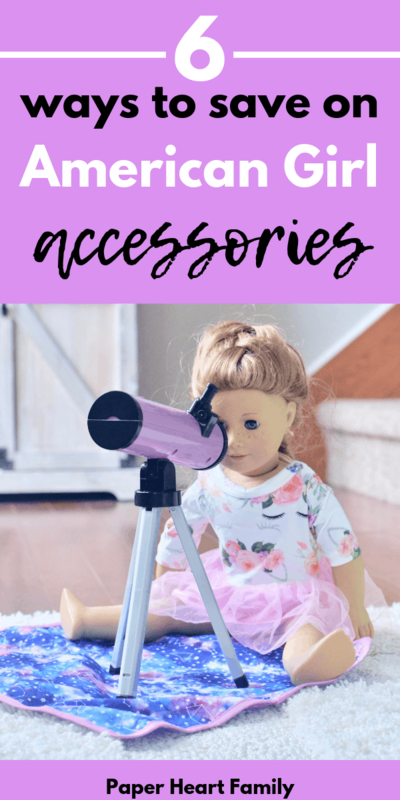 While I LOVE American Girl products and their superior quality, and while we do own a few very carefully chosen products, most of the accessories that we own are more inexpensive options. This list will show you the best, cheap American Girl doll accessories. These are the perfect gifts for 6 year old girls (or 7, 8, 9… you get the idea). Of course, these will work for any 18 inch doll as well. 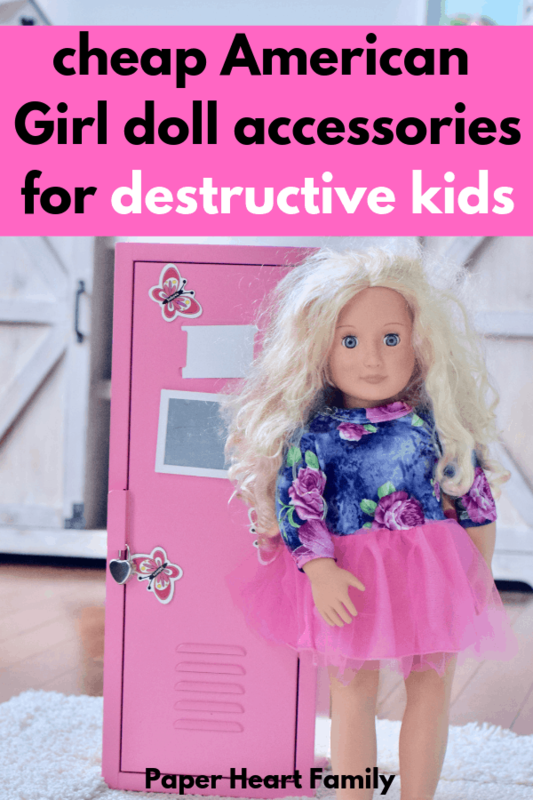 We’re going to look at how to save on American Girl products and what American Girl products are more inexpensive, and also some other accessories that aren’t made by American Girl. You will be absolutely surprised at the quality of some of the American Girl “knock-offs”. There are quite a few ways to save on authentic American Girl brand dolls and accessories. Going to the American Girl store nearest you is quite an experience. However, if you really want to save money, consider buying your American Girl doll accessories online. You are MUCH more likely to spend more when you are face-to-face with all of the amazing dolls and accessories that American Girl has to offer. Especially if you’re like me and being around American Girl stuff brings out the little girl in you and makes you want to buy ALL THE THINGS. Sign up for AG Rewards. Save $10 dollars for every 200 points earned, and also receive member’s only perks and a birthday gift each year. Shop sale items and monthly specials. April’s big sale item is Kit’s Garden Stand. It’s a GREAT deal at 20% off, making it only $80. It’s a 44-piece set with lots of interactive features, such as removable signs, reversible price signs, and a scale with a moving needle. If your child is interested in getting into American Girl, but doesn’t really know what she’s interested in, I suggest getting some American Girl books or American Girl movies. In this way, your child can see what she’s most interested in first, instead of randomly buying things. My daughter loves McKenna (because she’s in gymnastics), Isabelle (because she’s in ballet) and the 2018 doll of the year Luciana (because she loves space). Figuring out which dolls she was interested in allowed us to purchase a few carefully selected items. If you request a catalog from the American Girl website, you can frequently find 20% off coupons in the catalog. It can also again help your daughter decide what she is most interested in. Zulily occasionally has American girl dolls and accessories listed for sale on their site. Make sure to check it often. When we first started purchasing American Girl and other knockoff brands, I was skeptical about the quality of cheap American Girl doll accessories. However, I was very pleasantly surprised with the quality of most of these other brands of American Girl doll accessories from Amazon or Target. I think we need to also remember that our kids don’t really care about the quality. Of course you want something that’s going to last, but other than that, it doesn’t matter too much. Below you will find some of the best cheap American Girl doll accessories, clothing and furniture. This camping tent is easy to assemble and comes with a carrying case and tie backs just like a real tent. It can sleep 3 American Girl dolls. Actually, this tent is so big that your CHILD can actually fit into it. Don’t believe me? Check out the photo reviews. The Our Generation Heals On Wheels was the very first accessory that my 6 year old wanted for her doll. This set comes with a wheelchair, crutches, leg cast, x-rays and more. Your child’s imagination will run wild with all of the ways in which her doll can get injured. How cute is this baking set? Complete with an adorable apron and lots of accessories, this well-made set is perfect for any aspiring baker. We have a couple pets for our American Girl dolls, and the dog playset is definitely a favorite in our house. Dolls can take a walk with their puppy, feed it, groom it and so much more. If you’ve never checked out American Girl doll accessories from Target, you’re missing out. We have a bunch of items from Our Generation and they are ALL wonderful. My 3 year old loves bathing her puppy with this grooming set. It comes with a bunch of super adorable accessories (my personal favorite is the storage cart– SO CUTE). My kids on the other hand love the hair dryer that makes noise just like a real dryer. This set is fantastic, as is the price. This ride-on doll scooter is super retro and cute. It comes with a helmet and like all OG products, is very well made. This cute kayak set is so realistic, and comes with so many accessories. My favorite (other than the kayak itself and the adorable life jacket) is the bag of All Natural Veggy Chips! A girls gotta have shoes, right? I love this set because it gives you so many options, from boots, to sneakers. They also come in super cute adorable colors. I love that you know what you’re getting with this set, while most other sets are a grab bag. Reviewers also love the quality of these doll shoes. Perfect for the gymnast in your life, this gymnastics set comes with a scrunchie, gymnastics leotard, mat, metal and lots of sparkle. This is my most favorite inexpensive clothing set because it’s so versatile. Many sets have a theme (winter clothes for example). This one however, gives you a bunch of different types of clothing. You get a winter outfit, summer outfit, dress, swim suit and mermaid outfit for a super cheap price. This clothing set is girly and fun, with 24 total pieces including dresses, swim suits, a tiara, headbands and more. Check out that flamingo outfit. Adorable! A variation from above, this fun set contains a few of the same outfits, but switches out the swim suits for jammies. P.S.- I adore that love dress and wish it were made in my size. If you’re looking for clothes and shoes all in one, this set of seven outfits and two pairs of shoes is a fantastic value. Your child’s doll can go from fun in the sun with her adorable bathing suit and aviator sunglasses to rainy day prepared with her umbrella. Your child will love playing with this versatile, quality set. If you’re looking for a gift to give to a young girl, this set will NOT disappoint. Complete with the dresses and shoes for so that your doll can pretend to be Anna, Elsa or Snow White. While this set is not as inexpensive as the others, its superior quality and uniqueness makes this set stand out. If you’re looking for a gift under 10 dollars, these hair accessories are sure to please. The pink, green, blue and purple extension clips will be loved for sure. Super easy to assemble and extremely sturdy, this living room set is the best available for an affordable price. Don’t you love the bean bag chair? This canopy bed is made for a princess, with a pull-out trundle bed, blanket, mattress and pillow. If your daughter has more than one doll, you might want to get a bunk bed. This bunk bed from Target’s Our Generation line is actually cheaper than the trundle bed above. It is however made of plastic, while the trundle bed is wooden. Any little girl would love this colorful bathroom play set, complete with a shower, vanity and toilet. The toilet actually makes flushing sounds and the vanity lights up. If you’re going the bathroom route, this bathtub would be the perfect addition. Once again, Our Generation’s attention to detail is on point with an owl hooded towel, cucumber slices, slippers, nail polish and more. We don’t yet have a laundry set, but it’s high on my daughter’s wish list and this washer and dryer set is amazingly cheap. It features a washer and dryer that both spin and make noise and according to reviews, it is very high quality. It’s super adorable, too! This doll kitchen set is an amazing quality, and comes with a ton of food and accessories. Oh, and did I say that it’s pink? It is ADORABLE. We own the Our Generation Awesome Academy School Room. As we were opening the package and revealing all of the little and perfect classroom accessories, I literally felt like a kid on Christmas morning. This is the toy of my childhood dreams and quite possibly is the best $100 dollars that I’ve ever spent on a toy. The classroom is huge and comes with every possible accessory that you can think of (doll sized papers that you can write on, functioning mini markers, a chalkboard, windows that open and close, mini books and notebooks, a white board that lights up, a working school bell and fire alarm, flip-top desks and SO much more. We also own the OG ice cream truck. I enjoy playing with this and the school along with my kids. It again comes with a ton of sweet treat accessories, a bell for when the order’s up, and more. At first I thought there were too many accessories because you can’t display all of them at the same time, but I just put some of them away in case we lose other pieces. The ice cream truck also plays ice cream truck music, has functioning lights and windshield wipers. It is a little cramped when you actually get a doll (or three) in it, but my kids don’t seem to mind. If your child is constantly giving check-ups like mine, the Vet Clinic Playset is a great choice. It features a working x-ray light box and two kennels for furry patients. What amazing cheap American Girl doll accessories did I miss?